In all my years as a teacher and tutor, I have yet to see a frown or a tear shed by students in creating or reading comics. 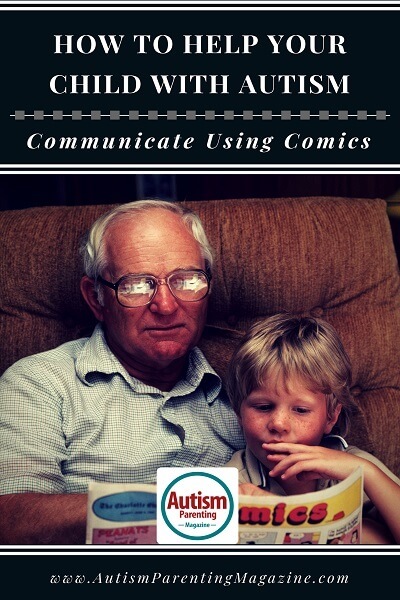 For those who work with children on the autism spectrum, the practice of creating comic strips with free comic generators like MakeBeliefsComix.com or even drawing them by hand can provide a useful, fun way to help young people express their thoughts and feelings. Creating graphic comic stories also provides a tool for parents, teachers, and therapists, to teach basic social skills and concepts to children. From my own experience in teaching youngsters and adults, I intuitively knew that enabling struggling students to write and tell stories by building comic strips online would help strengthen their emerging language skills and make learning a much easier, more enjoyable experience. That is why, in part, I created MakeBeliefsComix. It is a venue where teachers and students can create digital comic strip stories, using a diverse cast of characters with different emotions, blank talk and thought balloons to fill in with words, and backgrounds showing different locations. I also thought that by parents and children working together to create comic stories, families would also draw closer. Comic strips provide a perfect vehicle for learning, for practicing language and expressing ideas. Each strip’s three or four panels provide a finite, accessible world in which funny, interesting looking characters live and go about their lives. And students with special needs are not as overwhelmed in dealing with the size of a comic strip as they may initially be with a book of many pages. You see, comic strips don’t require long sentences or paragraphs to tell a good story or communicate ideas. They encourage students to write and create because only a few words are required for the characters to go about their lives and reveal their stories. And, anyone who sees a blank talk or thought balloon floating over the head of a character wants immediately to fill it in with words and thoughts; doing so is the beginning step to telling a story. What do we want this character to say or think? Comics help children learn how to read and think imaginatively. The comic characters can become their friends and family, and they began to realize that reading and writing can be enjoyable and open up new worlds to them. By giving children a choice of fun animal and human characters with different emotions–happy, sad, angry, worried— as well as blank thought and talk balloons to fill in with their written words, and some story prompts to spark ideas, youngsters, and teachers will be able to tap into their creativity to tell stories and create their own graphic stories. A parent or teacher, for example, could put together a comic strip with characters and blank thought or talk balloons, print it out, and ask children to fill in the balloons with words and narration. Better yet, a student can choose his or her own characters and develop stories alone or with a partner. Educational therapists who work with children with autism or with deaf or learning disabled, as well as trauma victims, also use comic strips to help their clients understand concepts and to communicate. Comic strips are a great way for students to practice new vocabulary words and to practice dialogue in different situations. A child, for example, who may be having trouble with another child at school can use the comic to come up with words and actions to help him deal with this problem. In effect, the comic characters can serve as surrogates for children to work out different problems. And, by creating comic strips together, parents and children learn how to work and communicate more effectively with each other to create something new and imaginative. Another student, also a 12-year-old with mild autism, used his words in the comic strip speech bubbles from the site to communicate deep anger. His comics, she said, revealed that he was being subjected to constant bullying in his general education classes. Discovering this, the teacher quickly notified the school’s administration to change his classes. Generally, in showing students how to use this comic generator website, I will first create with them a joint comic strip incorporating their ideas. Let the youngster play around a little on the site to get used to the materials offered and do something simple, such as having two characters talk about something they like or hate or even their plans for the school holidays. I’ll have the youngster choose a character to represent herself or himself. It’s fun deciding which character will represent you. In filling the first comic panel template, I ask students to choose a character and for suggestions for dialogue, and next, I’ll ask for more dialogue for another character to speak. If the student can’t type, the teacher can type the words for him. Then we’ll try to move the story along by moving to a second panel. Later, when students start their own comic strips, some can be encouraged to work with partners to help each other along. Such collaboration gives students more confidence and ideas in creating a story. As the students gain more confidence in using the comic generator, a parent or teacher might want to get into more serious subjects, such as what is troubling him at school or a problem she is having at home. Social stories can be easily created, too, to help youngsters navigate in the world. One example: What happens when a person meets someone new. What do they say to one another, how does one socially interact? A parent sitting down at the computer with a child can create a three- or four-panel comic strip that shows two people greeting one another and then filling in talk balloons with text that suggests what a conversation might be like when two people first meet and interact. This could include such things as saying “hello” to each other or asking “how are you?” and introducing themselves to each other. Or have the youngster explore each of the four emotions a character shows on the site. Which one is angry? Which one is happy? Which one is sad or worried? And consider having the student fill in a thought or talk balloon next to a comic character to express his or her feelings. Fill in a thought balloon to answer the question, What is this person thinking? What is she feeling? Other subjects for creating social stories in the form of comix: How to act in class; What to do when someone is annoying me; Being afraid; A happy day. You can build all kinds of stories to deal with other subjects, such as discussing the different emotions we have in different situations and how to express them, as well as interacting with people in the community or at school, even dealing with a bully. Creating comic-strip stories can help children better understand how to handle themselves in different situations, some of which can be distressing to them at first but which, in time, can be mastered through building visual stories that help explain the situations more clearly and the path for negotiating them. In addition, building comic strips provides a safe way for students to share their feelings with others. One psychiatrist who works with children with autism also suggested that for those children who are silent or do not speak, it would be helpful for parents or therapists to read aloud, with expression in their voices, the words that the youngsters write in the thought and talk balloons for their characters in the comic strips. Doing so helps reinforce the emotions expressed both in the characters’ facial and bodily expressions and in the words they utter. A pediatric occupational therapist uses comics to teach things like stranger-danger skills/stranger awareness (abduction prevention skills), sensory strategies, interpreting body language, how to deal with bullying, and understanding and respecting personal space. Creating a situation and letting the characters act out a solution, then let the child tell the therapist if it was a good choice and discussing it. As you and your youngsters continue to create comic strip stories, consider printing out their stories so that the students build a portfolio of their work and what they have learned from the comic creation process. (MakeBeliefsComix.com also allow you to save the comics online.) Their print or digital portfolios become something the children can refer to from time to time, reinforce the learning they have experienced and are a visual way of showing the worth of the students in creating something special that helps them live their lives with improved skills and satisfaction. Bill Zimmerman, creator of MakeBeliefsComix.com, for many years was creator and editor of the nationally syndicated Student Briefing Page for Newsday newspaper; this feature was twice nominated for a Pulitzer. He is the author of two dozen books, including such best-sellers as Pocket Doodles for Kids, Lunch Box Letters: Writing Notes of Love and Encouragement to Your Children, and Make Beliefs: A Gift for Your Imagination. His books help young people discover their writers’ voices. You can view his free e-books both at his websites. He welcomes all questions and suggestions for improving MakeBeliefsComix.com to make it more fun and useful to educators and students so please email him your feedback. Bill Zimmerman creator of MakeBeliefsComix.com, for many years was creator and editor of the nationally syndicated Student Briefing Page for Newsday newspaper; this feature was twice nominated for a Pulitzer. He is the author of two dozen books, including such best-sellers as Pocket Doodles for Kids, Lunch Box Letters: Writing Notes of Love and Encouragement to Your Children, and Make Beliefs: A Gift for Your Imagination. His books help young people discover their writers’ voices. You can view his free e-books both at his websites. He welcomes all questions and suggestions for improving MakeBeliefsComix.com to make it more fun and useful to educators and students so please email him your feedback.